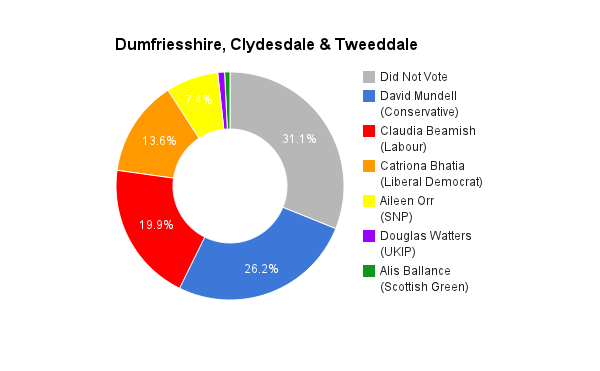 Dumfriesshire, Clydesdale & Tweeddale is located in the south of Scotland. The seat was created in 2005 and has been held by the Conservative party ever since. The current member of parliament is the Conservative Party’s David Mundell who has served since 2005. I am committed to more participatory local democracy, where decisions are made by the people best qualified to make the decision. Too often the electorate’s wishes come second when it comes to key local issues, and it’s time people were truly consulted. “Public consultations” end up being set up to create a self fulfilling prophecy, and when it doesn’t work that way, decisions tend to be bulldozed through anyway. It’s unacceptable. I believe I am the best candidate for this constituency because simply the wishes of the people are more important to me than the wishes of my party. All political parties tend to work more in their own interests than in what’s best for local people, and I think that’s completely wrong. I would fight hard to ensure the range of skills and expertise in Dumfriesshire, Clydesdale and Tweeddale is more important when making decisions rather than simply working for the whims of our elected members. I appreciate some of our current MP’s effort on local issues, but unfortunately, there hasn’t been too many successes. Our current MP doesn’t seem to have the influence I hope he would, but I do appreciate those efforts on issues like saving local hospitals, green bins, the Leadburn roundabout and others. Austerity would be the biggest financial busted flush of the 21st century if it wasn’t for the crash of 2008. We were told Austerity was the only way we could close the deficit by 2015. That failed spectacularly. It has left people languishing in poverty and ensured that our economy recovered to pre-2008 levels at one of the slowest paces in the Western World. That we have the “fastest growing economy in the Western World” right now is almost a direct effect of how slowly we recovered when compared with everyone else. The quality of life in Britain is at an all time low for an unacceptable high percentage of the population, and society must come first if we are to run a successful country. Immigrants are net contributors to the British economy. We all know this. It absolutely does not need more controls. I personally believe that the true economy drivers are people. When people have disposable income, they spend it and stimulate the economy. Nowadays we have people working 40 hours a week, but because of the longest period of wage suppression since the Victorian era, we have full time workers struggling to make ends meet. It’s a scandal. I believe the best way to correct this is to raise the minimum wage to the living wage of £7.85 immediately and then work towards a £10 minimum wage by the end of this parliament. The NHS needs to be properly funded. I think everyone agrees with this. I would like to see the Health and Social Care Act 2012 repealed and ensure that all PFI’s and private contracts are allowed to run out and aren’t renewed. These to me have been the biggest failures in the Health system. Too often the rhetoric around the unemployed is that they are lazy layabouts. I worked a number of years ago with the Princes’ Trust and can confirm that the vast majority of people who are unemployed are not unemployed by choice. Some lack skills. Some lack direction. We need to ensure people are being pushed in the right direction and it can be done, but not under the current system. Absolutely. As a white male, perhaps I am now part of the problem, but overall we live in a world dominated by white males and that has to stop. We can’t address the problem however by simply having all female or all ethnic minority shortlists. It’s a start, but the attitudes have to change. We have to work towards encouraging strong people from all backgrounds getting involved. Left wing euroscepticism seems to have died out in the last couple of decades. I find this strange considering the EU wholly conflicts with the left wing vision for a better Europe. It’s undemocratic, unaccountable and pro-capitalism to a dangerous level. The debate on immigration however doesn’t matter to me, as I don’t think EU immigration is a problem. While I’m not saying I would campaign for an exit from the European Union, I personally feel it needs drastic reform before I could fully support staying in. Right now would encourage people to do their own research and come to their own conclusion. It may be a debate I stay silent on!